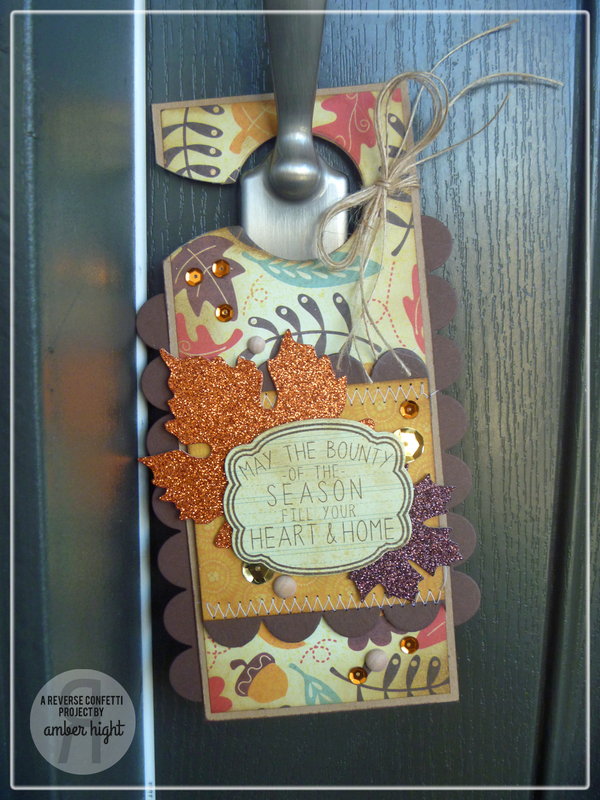 Welcome to Verve's October Release Retrospective Blog Hop! 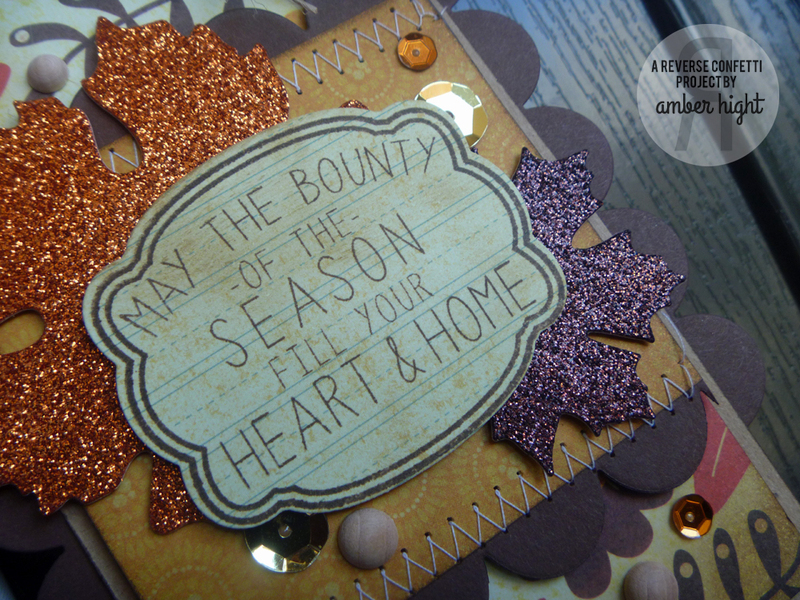 The Verve Divas are hopping today and serving up some more inspiration using the October release stamps & dies! 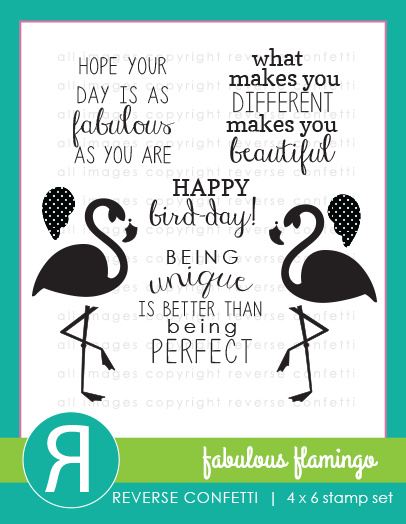 Besides a look-see at some really nifty cards, there's also a comment prize up for grabs! 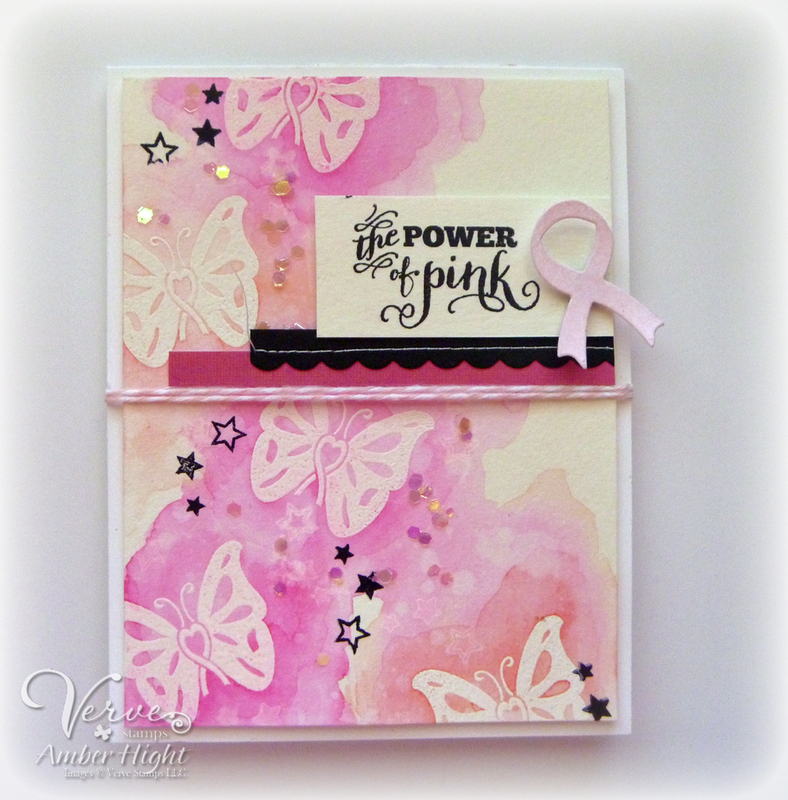 I've been having so much fun with the new Pink Power and Inspire Hope stamp sets so I created a card using them, plus this week's Viva la Verve sketch and inspiration picture! 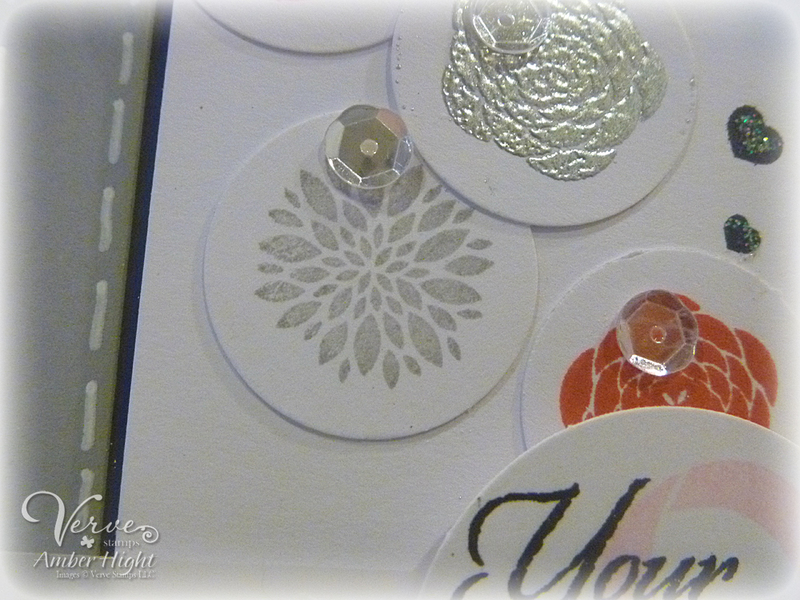 I love the little bloom stamps in the Inspire Hope set, so I cut out some circles with my 1" circle punch and stamped some in pink, some in gray, and then I embossed a couple with silver embossing powder. 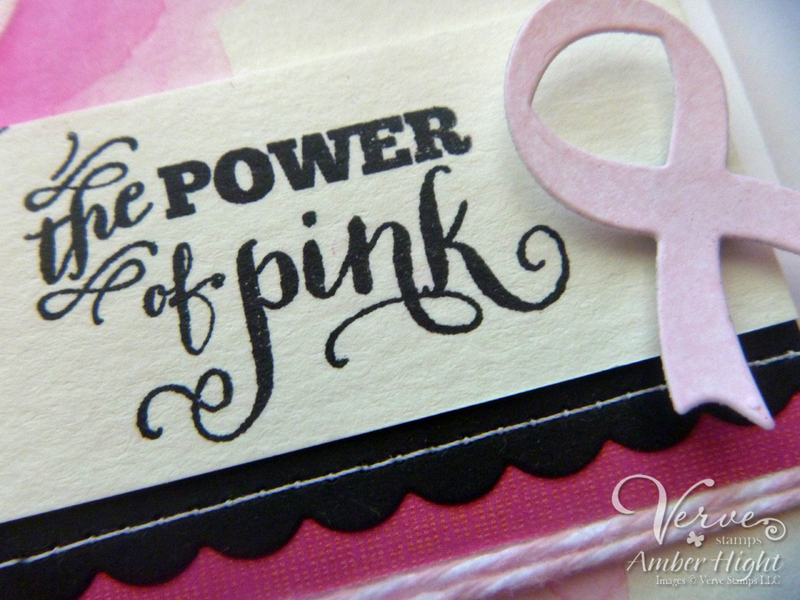 The little hearts on the white panel and the ribbon on the sentiment panel are from Pink Power. Want to win some shiny new Verve? We're giving away a $40 gift voucher to one lucky commenter along the hop, so be sure to leave a shout out in the comments as you hop about. 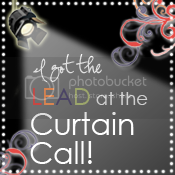 Your next stop is Jen's Blog! See the list below in case there are any hiccups in the hop:) Thanks for stopping by! 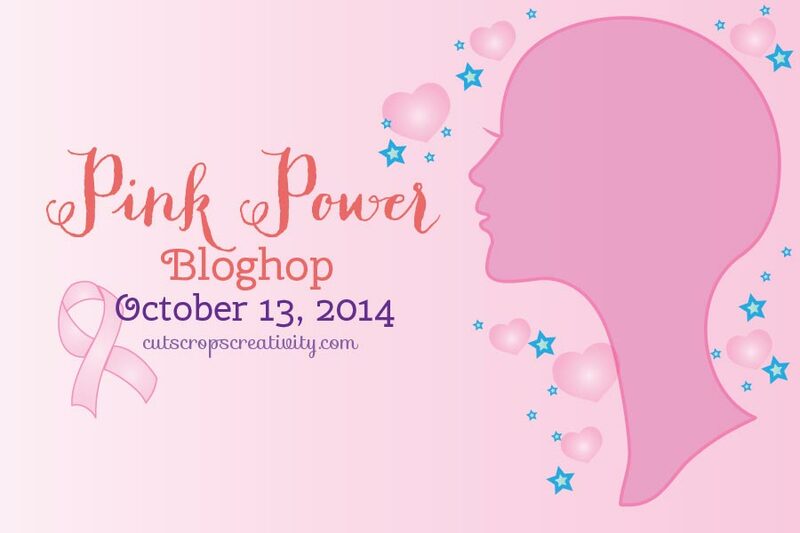 Pink Power Blog Hop: Fight like a Girl! Hello there! 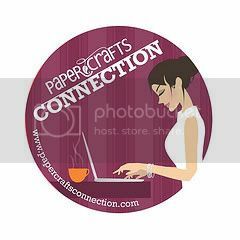 I'm here today participating in a fun blog hop hosted by Chaitali! Chaitali has rounded up some of her crafty friends to help spread BC awareness. This is a cause close to her heart after her mom was diagnosed with BC earlier this year. She designed the Pink Power set for her mom with a lot of love. She is sponsoring this hop with the set for the hop guests. We also have some of the Verve DT playing in the hop today! You should have come to me from Virginia's blog, but if you haven't, you may want to start at Chaitali's Blog and hop through so you don't miss a single one! This is such a gorgeous set that Chaitali designed. I love this bald silhouette, isn't she gorgeous? I thought she deserved to sparkle so I added some Stardust Stickles to her, now she looks proper:) The sentiment is also from Pink Power. 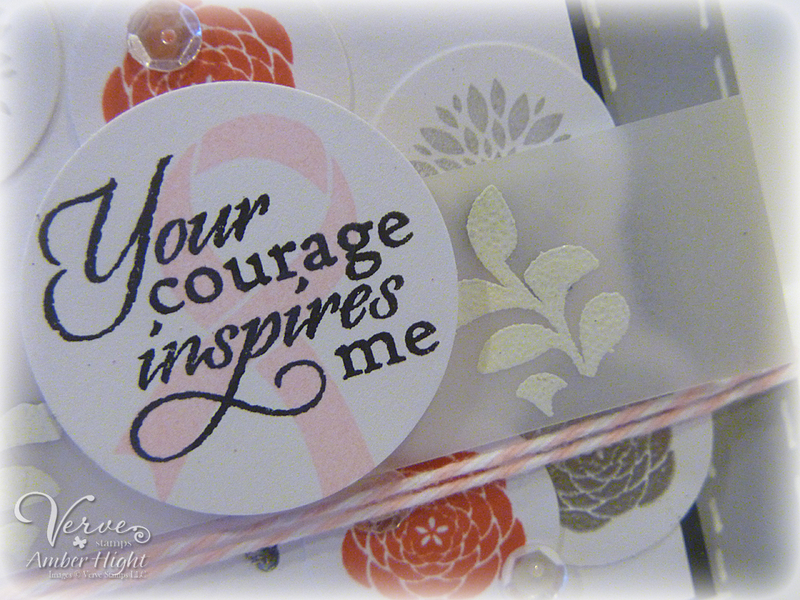 If you are a member of Splitcoast Stampers, you probably already know that this month is the annual Hope You Can Cling Too event, challenges all week long! We encourage you to play along in the challenges here! Hello there!! 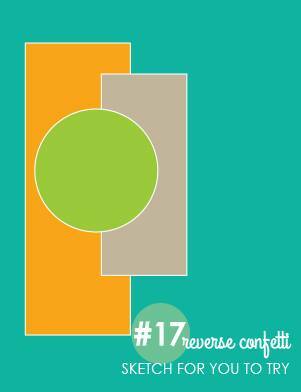 I'm here today with a card for this month's SFYTT over at Reverse Confetti! I'm sure you've seen the sketch by now, pretty fun one! 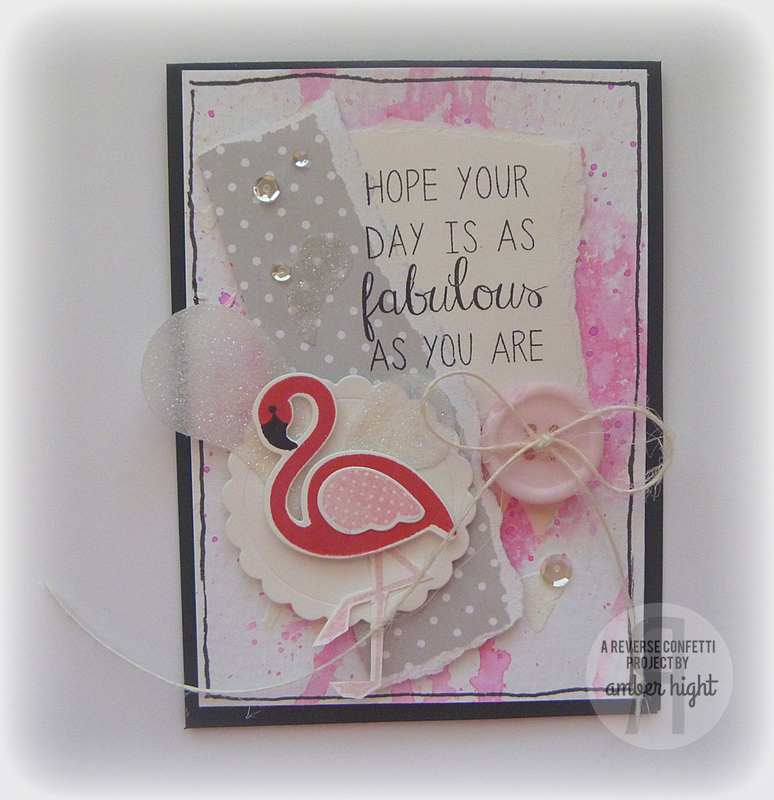 Here's my card using the Fabulous Flamingo set! I had to adjust the sketch to fit my card, but really like how it turned out. The base watercolor paper was spritzed and watercolored in pink. I mounted that on a black card base. 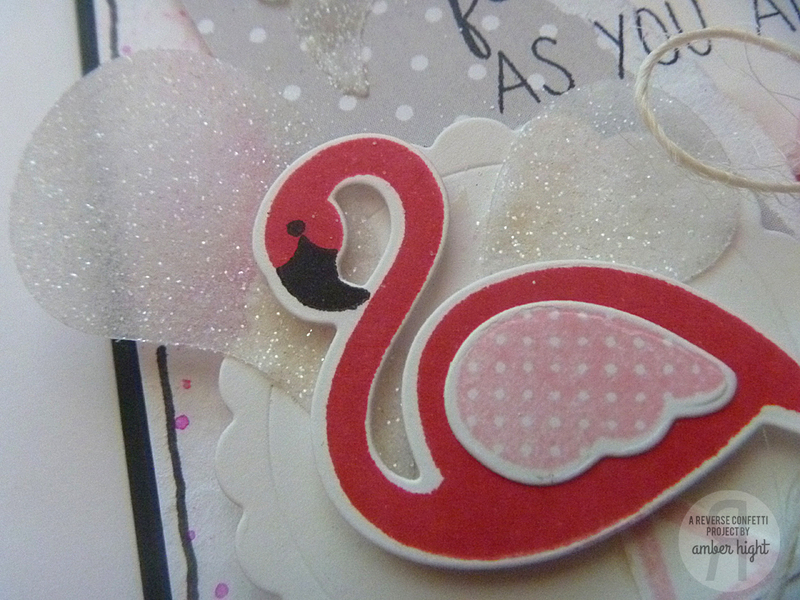 Using the Fabulous Flamingo dies I cut out a flamingo and stamped her in a couple shades of pink. Next, I cut out 3 paisleys with the Perfectly Paisley Confetti Cuts from vellum and ran it through my Xyron sticker maker. Then I sprinkled glitter on the paisleys and adhered them behind the flamingo. 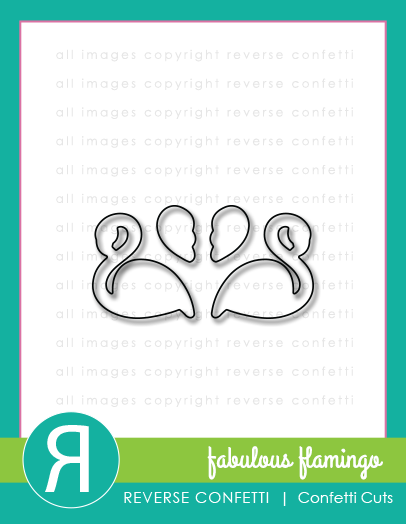 Such a fun set, love these flamingos! 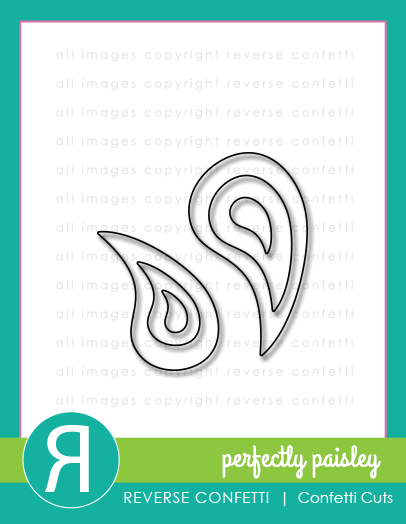 Hope you get some time to create this weekend, why not try the sketch! Please go to the Reverse Confetti Blog for the sketch details and links to the other girls playing along. Thanks so much for stopping by today! Hello! This is my 2nd post today, if you're looking for my Reverse Confetti Post, please scroll down, thank you! 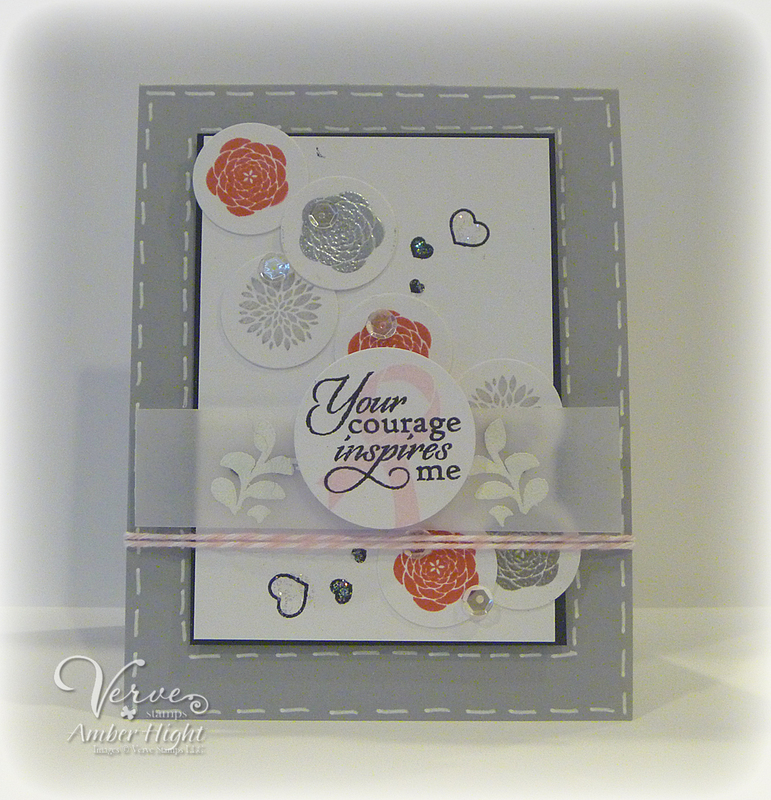 Today, the Verve team is sharing projects using the newly released Inspire Hope stamp set! This is a truly beautiful set with some really meaningful sentiments. I kept the layout and composition quite clean on this card and opted to focus on the sentient. The sentiment on my card is actually three different stamps. The frame stamp is separate, and then the flower is also a separate stamp. So much fun in this set! I added some Stardust Stickles to the yellow flowers and some silver pearls. 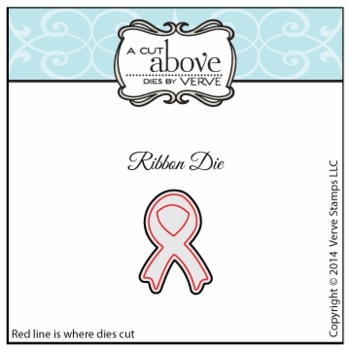 The white ribbon is from the Signature Ribbon Collection. Want to win some shiny new Verve? One random winner of a $30 gift voucher to the Verve store will be drawn from the comments on the blogs linked below. So be sure to leave a little shout out in the comment box at each stop along the way to increase your chances! Check out the Verve Blog today for the scoop on prizes and today's featured products! Hello there! 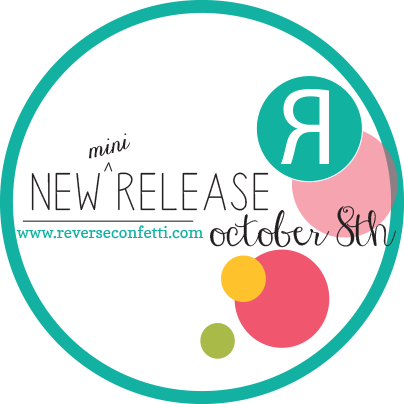 Welcome to RELEASE day at Reverse Confetti! 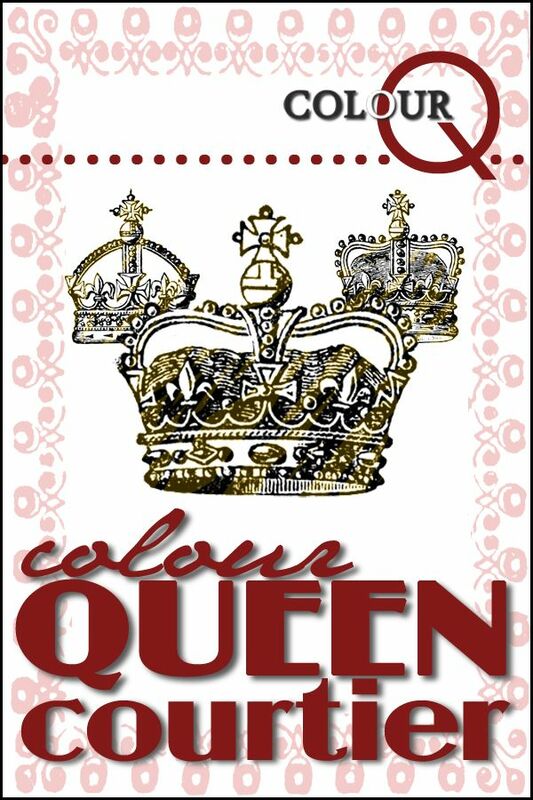 Don't you ADORE the new stamps we're releasing this month? Jen's releases have been better and better every month, these are such amazing stamps. 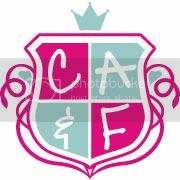 I had so much fun creating with them, and know you will too! You should have come here from the Reverse Confetti Blog...if you haven't, please do go back and start there so you don't miss any of the hop details! My door hanger is 3.5 x 8.5 inches. I cut the base out of a piece of chipboard to make it a bit sturdier than regular cardstock. The patterned paper is by Simple Stories (I think? ), from a couple years back. It's old and I'm trying to use my stash, haha! I cut the label with my Give Thanks Label die and stamped the sentiment from Give Thanks. 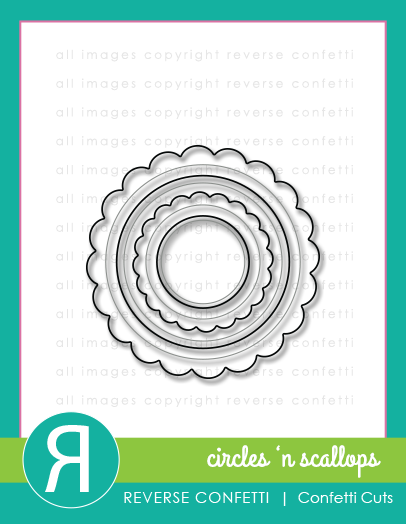 The scallops are the largest side of the Double Edge Scalloped Border die. The leaves are from Michaels from last year, and I used some Walmart sequins and Teresa Collins wood flatbacks. Now it's time to hop on over to Jessica's Blog! I can't wait to see what the rest of the team has to share! If you get lost along the way, you can always pop on over to the Reverse Confetti Blog for the entire hop list! 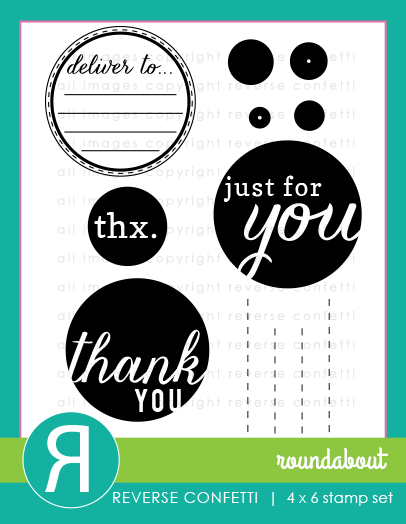 Thanks so much for stopping by today, hope you are able to purchase these amazing stamps and dies this month!! It's quite a busy week on my blog, so I hope you find what you're looking for! If you're looking for my Reverse Confetti sneak peek post, please scroll down to the post right below this one, thank you!! 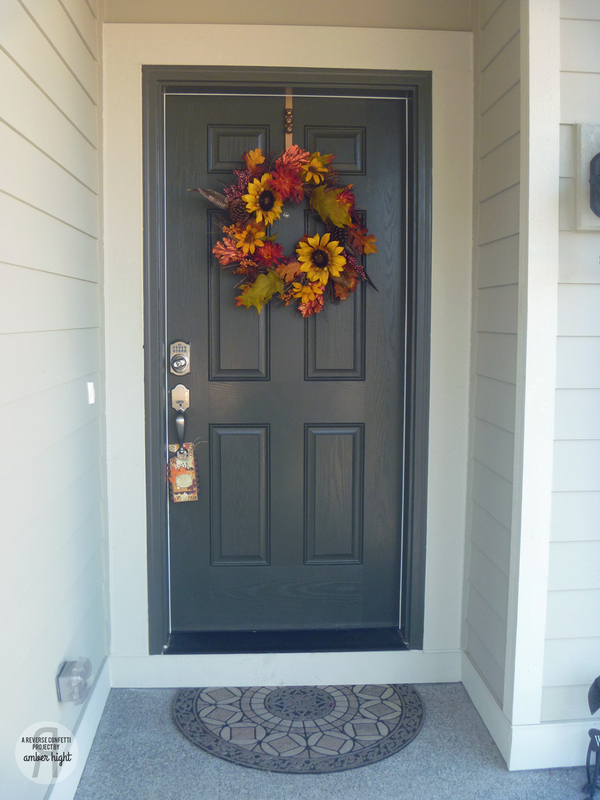 Welcome back to Verve's October 2014 Release Celebration! Three new sets, three new dies and a sequin mix just released on Saturday and today we're back sharing our inspirations with a new set illustrated by Chaitali Narla called Masquerade and the new Gown Die and Mask Die Set! You may recognize these stamps as I used them on my card on Saturday! Well I was pretty excited to pull them out again today, so lets get to it! 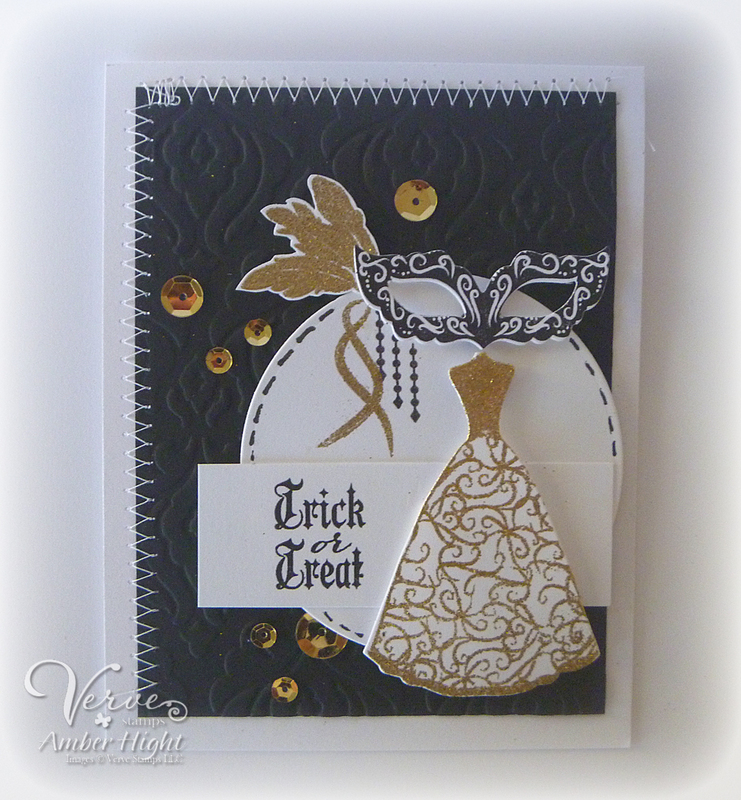 I used both the new Gown Die and the Mask Die set for this card. I know the proportions are a little wonky, but I still thought it would be fun to pair these together. 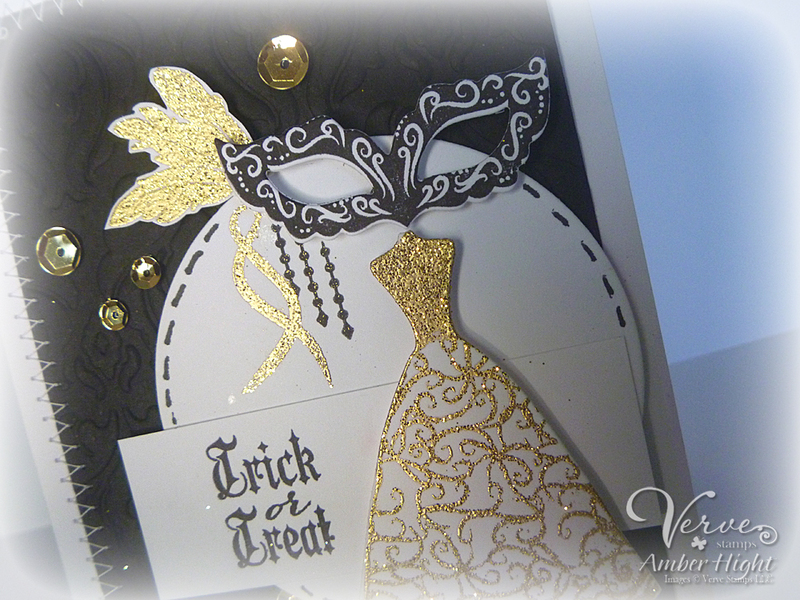 I embossed the dress, feathers, and ribbon in gold embossing powder. The mask I just stamped in black ink. I embossed the black background with a Cuttlebug folder and my big shot, and then sprinked some gold sequins. Oh boy...are you in for it today! I am so excited about the mini release Jen has come up with for October! 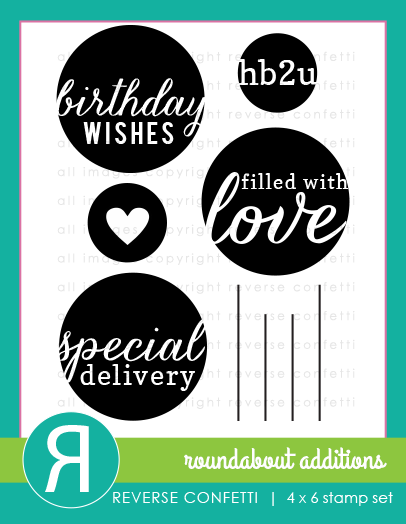 These are some of my favorite stamps ever, I love the huge circles and countless possibilities for these sets and new dies! 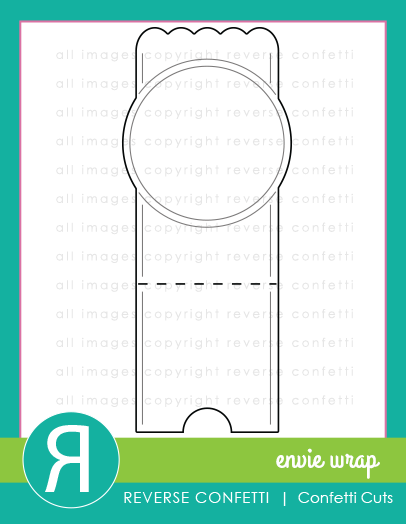 Today, half the team is showing you Round About, Round About Additions, and the Envelope Wrap die, and the other half is sharing the new door hanger die! Are you ready to get started? 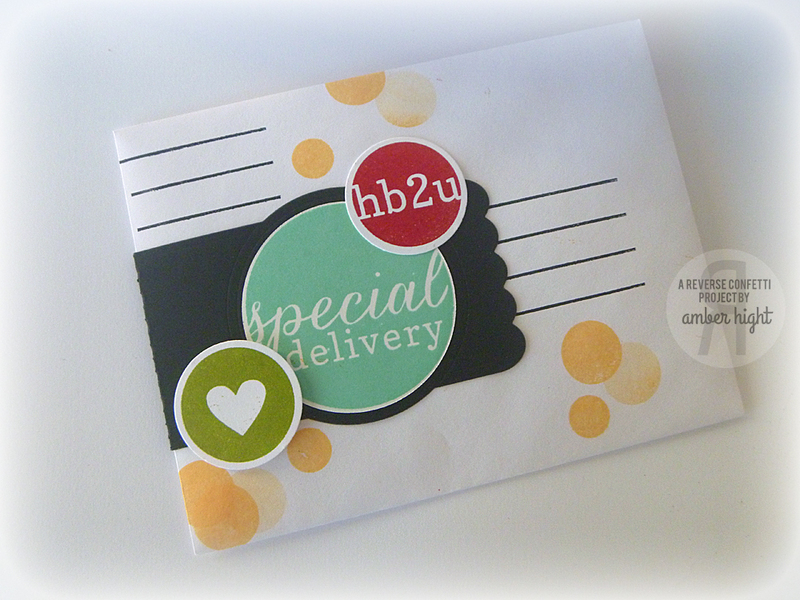 I've got a little duo to share today using the new Round About, Round About Additions, and the new Envelope Wrap die! I didn't do it on purpose, but looking at the RC header, it sort of resembles that, doesn't it? LOL! For the card, I stamped various images in different colored inks. I cut them all out with circle nestabilities. I adhered them with dimensionals on the card base and then added some sequins and more bokah-style stamping on the white base. I mounted the whole white panel on a black card base. I added some white liquid dimensionals to the hearts and they are puffy and cute in real life! Well that's it for today, make sure to check out what the rest of the team has come up with! Hop on over to the Reverse Confetti Blog for a list of girls playing along. I'll be back tomorrow with more, thanks for stopping by! 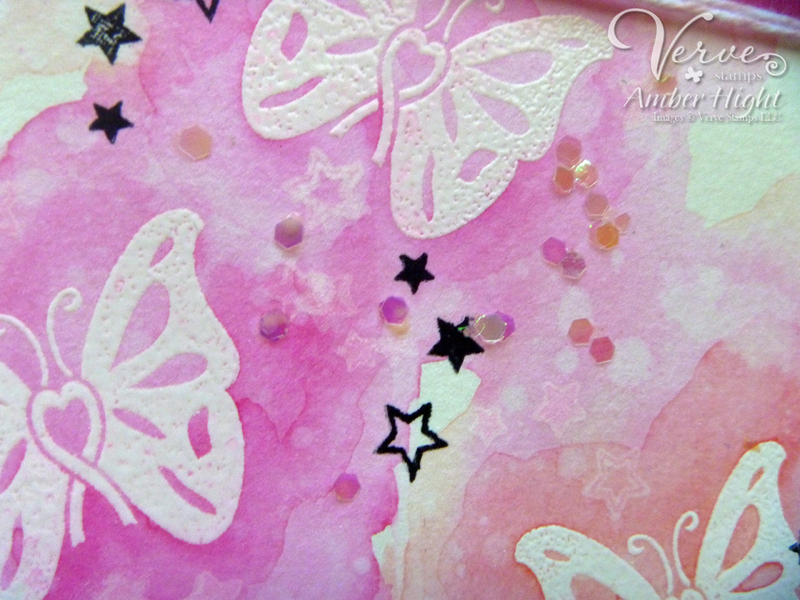 Today, I'm here with a card using the amazing new Pink Power stamp set from Verve. As you probably already know, October is Breast Cancer Awareness Month and Chiatali designed this set in honor of her Mother who is right now battling this disease. I don't personally know anyone fighting Breast Cancer, but I know that so many out there do. 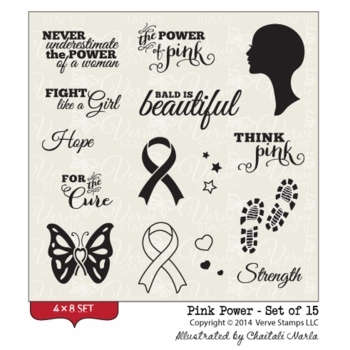 I think this stamp set is amazing and would be perfect for creating cards for your friend or family member fighting breast cancer. 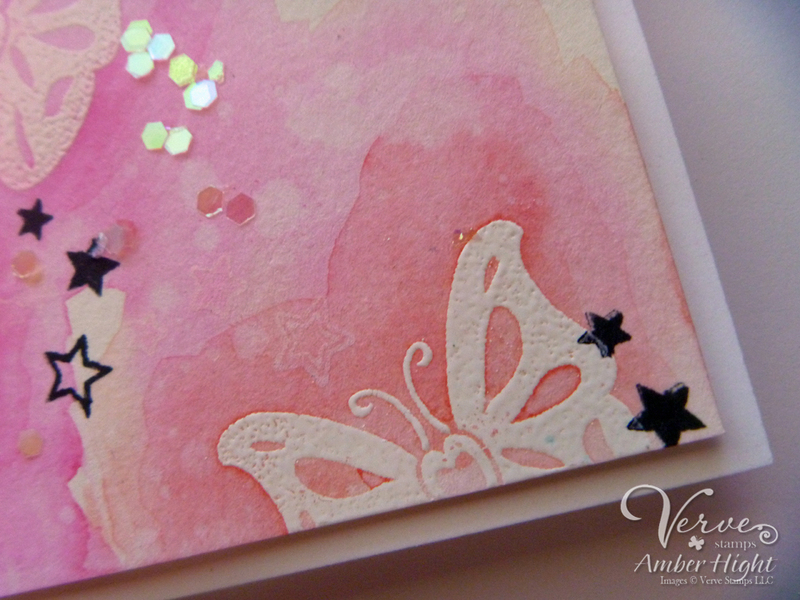 I decided to use the beautiful butterflies in the stamp set for my card today. I embossed them in white on a piece of watercolor paper. Next, I ran a couple pink Tombow markers over the butterflies and then, with a wet, round paintbrush, moved the ink around. I just ADORE these markers and the fabulous watercolor effect I get with them. They are one of the best crafty investments I've made! I stamped the little trail of stars in white and black ink around the butterflies and then applied some glue and chunky glitter. I found that glitter at Walmart for like 3 bucks and loved it when I saw it. It reminds me of bokah, and it's so shiny and gorgeous! I spritzed a bit of pink Heidi Swapp Colorshine on a piece of cardsock and then cut the ribbon out with the Ribbon die from that pink misted cardstock.